The enameled plate could possibly be French, but there aren’t any markings on the plate. At first, I thought the floral decoration was hand painted, but have found out it’s a transfer. 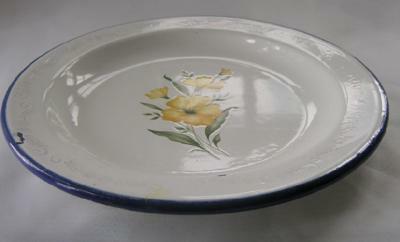 There is also a light, somewhat faded, scroll pattern around the rim of the plate. Unable to find anything like this transfer printed enamel plate on the internet. So any and all comments or information would be greatly appreciated.